Wow. I'm stil reeling after reading this one. I went into this book with zero expectation and I'm really glad I did because it was great. I loved the crazy, amazing road trip Harrington takes us on throughout the book. This review was a little difficult to write as this book hits close to home a little bit. The Good: Firstly, the achingly beautiful and haunting words of Harper feel so weirdly familiar to me. See, I too, have had a dearly loved one commit suicide and there is absolutely nothing anyone can say or do that makes it feel any better those first few years. Seeing and feeling Harper's palpable pain was excruciating for a bit because it reopened all the wounds I've managed to push deep inside of me about my own loss. Poor, poor Harper. What makes it even worse (or maybe better?) is that Harper and I...we could be interchangeable in some instances. From the way she thinks to the way she talks, it's almost like a walking replica of me. Talk about weird. Now lets get to the story. I thought it was genius really. Harper's need to find closure for her sister's death ultimately leads her to California, but it also allows her to find out more about herself than she was ever willing to do before. The road trip was a great catalyst for all things to fall into place and I loved that aspect of it. I absolutely LOVED Laney and Jake. They were extraordinary secondary characters. Laney reminds me of my best friend in high school. But it seems to me like Laney and Harper would stay friends forever. Laney is the type of friend every girl should want in a sense. She's the unwavering-I'll-always-be-there-for-you type of friends. And Jake. Oh my gosh, Jake. I pretty much adore him. He has this tough, bad boy exterior but he absolutely melts the heart. Even though you know he's hiding something from the very beginning, you can't help but forgive him for whatever it was that he did because he's just so genuine and it's so evident that he adores Harper. The romance between them was so REAL and TANGIBLE. No insta-love, in fact...there was insta-hate before they gradually and slowly fell for each other. It was honestly, one of the most perfectly paced relationships I've seen in a novel. Now onto the most crucial part of any novel--the writing. It was amazing. I was so impressed with Harrington's writing that she immediately landed herself a spot on my favorite authors list not to mention my list of authors I admire. I think one of my favorite parts of this novel was the amazing dialogue. It was just written so well, believable and just beautiful. This novel is as funny and witty as it is sad and harrowing. June is this...idea that plagues everyone in the novel and it's not until people really face who she was or what she was about that they come to terms with her loss. I haven't mentioned it yet, but this book is chock full of great music. Like almost the entire subtext of this novel is based around music and it's really awesome. The author has great taste in music. She even includes a soundtrack list at the end that's pretty damn awesome. I also really appreciated and enjoyed the road trip aspect of the novel. I really haven't read many well done road trip novels lately, so it was nice to finally read one that I have such high praise for. Really, I enjoyed this book so so much. 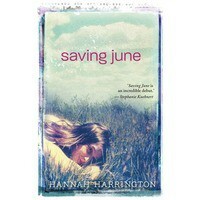 I cannot wait to read more by Hannah Harrington. The Bad: My few problems with the novel are really insignficant when compared to the whole but they are worth mentioning. First of all-- 16, 17 and 18 year old on a road trip. At the basic level, it's believable. I know there are some parents out there who may be lenient enough to let if fly but the majority of parent-no way. It kind of baffled me how Harper's parents (especially her mom) didn't go off the deep end when she found out she'd left. I mean...she's 16. Legally, she could have called the police and had her found. Not saying that would have been the right thing to do, but it would have made sense. It made less sense that after losing one daughter she would let her other one go off on a road trip across the country with supposedly just her friend. Along those same veins...are all three of them rich? They seemed to spend money and/or have money available to them at any and all times. This didn't seem all that realistic to me. I mean, the first thing teenagers would find on a "real" road trip was just how much under planning went into everything and the lack of money. But hey...what do I know? Lastly, there were several points in the book, I was like...mmm...why are they doing this? How is this relevant to the plot line in any way? An impromptu protest which nothing really happens and a random concert at a detour stop...why? Just because? Filler storyline? I was confused about that. Overall, I loved this novel. I couldn't give it 5/5 or an A+ was because of the above mentioned items but it came pretty darn close. It's one that I will be recommending. I would say this book will fall into many categories and be enjoyed by a variety of fans including Contemporary YA, Road Trip novels, novels about death and grieving.